Keeping out wildlife from your lawn. Wild animals can be considered pests and pose major inconveniences to your home. They can cause damage to your house, your lawn and leave an unsightly untidiness. Wild animals can borough under your home, weakening the foundation, or even claw their way into your walls and take up residence inside your home. Wild animals can also do major damage to your lawn by eating up your fruits and vegetables, digging holes that can interfere with your utility lines or even stripping all the bark off your trees. Many animals are just looking for their next meal which is unfortunately going to come from your home, creating a big mess. 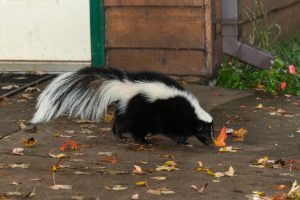 They will get into your garbage bins, eat all your pets’ food and where animals eat, they will also do their business. If you are having problems with wild animals, there are several do it yourself tips to get rid of them. Fences: Rabbits, deer, and other wildlife are attracted to an easy food source. A fence will deter animals from munching on your plants. Motion Sensors: Originally design to deter intruders, they also work well against wild animals, or even your own pets! Motion sensor lights abruptly change the environment startling raccoons, skunks and rabbits. Animal Repellants: Though effective, be sure to choose a repellent after you’ve cited the wild animals that are damaging your lawn. The keys to success when protecting your property from wildlife are variety, persistence, and adaptability. Apply repellents and install scare tactics before animals start feeding on your grass and garden. Try different combinations of tactics and adapt as needed. If it becomes much too hard to handle, call in some wildlife control experts. It is easier to prevent wildlife than to break their habits. Try to find repellants that are all natural and smell good so they will only repel animals and unwanted insects, not you and your family. Fire Up Your Imagination with Edwards Lawn and Home! For the past ten years, Edwards Lawn and Home has been offering premier residential and services to improve your property all year long. The options are endless from a new patio to a backyard fire pit, let the winners of Angie’s List Super Service Award serve you! If you’re interested in finding out more about our services or getting a quote, you can contact us online and check out our portfolio or give us a call at 443-341-6539. For more information about our services or DIY tips and tricks follow us on Facebook, Twitter, Google+, LinkedIn, YouTube and Houzz. This entry was posted on Friday, July 14th, 2017 at 4:08 pm. Both comments and pings are currently closed.